FILE - South Sudan's rebel leader Riek Machar poses for a photograph as he is interviewed by The Associated Press about the situation in South Sudan. South Sudan rebels loyal to former vice president Riek Machar said phase one of their new advance team of 262 people will leave Gambella, Ethiopia on December 11 for Juba and the 10 states of South Sudan. Phase two comprising 339 people will follow on December 18, 21 and 22. Ezekiel Lol Gatkuoth, secretary for foreign affairs of the Sudan People’s Liberation Army in Opposition, said the leader of the team will be chief rebel negotiator General Taban Deng Gai. The rebels first announced their advance team was to arrive in Juba on December 1. But that plan did not materialize because of what was described as logistical problems. Now, Gatkuoth said those problems, including plane tickets and accommodation for the delegations, have been taken care of by the international community, which supports the South Sudan peace process. FILE - South Sudan President Salva Kiir voices his reservations before signing a peace deal in the capital Juba, South Sudan. Gatkuoth also said the rebels have received written communication from the Juba government since last month that it is ready to receive the delegations. He said the purpose of the advance teams would be to prepare the modalities for the implementation of the August 26 peace agreement. “First, we have people who will be involved and engaged the government in the implementation of the agreement, the cantonment sites of all the forces, the transitional government of national unity will also be established, the selection of the ministers, and the reconstitution of all the institutions of government in South Sudan – the general implementation of the agreement is what they are going for. That’s why the team is being led by the chief negotiator,” Gatkuoth said. Gatkuoth also said while in Juba the delegations will be engaging former Botswana President Festus Mogae, who is head of the Joint Monitoring and Evaluation Commission (JMEC) set up by the Intergovernmental Authority on Development (IGAD) to monitor the implementation of the August 26 peace agreement. 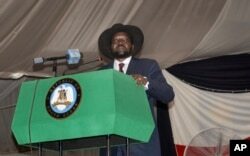 He said the rebel delegations will also be engaging with President Salva Kiir and other South Sudan government officials.